Let’s talk about bags. We all have at least one. Whether it’s for uni, work, gym, or for everyday use, everybody has a bag in their cupboard. Even though this item is an absolute necessity, we don’t often ask these questions when purchasing one: who made this bag? Were they paid fairly for their labour? What impact did its creation have on the environment? Well, if you shop with Duffle & Co, you won’t have to. Duffle & Co is a brand that is committed to bringing consumers quality-made bags and wallets, though without harming anything in the process. Each and every one of their timeless products is hand-crafted, and the profits contribute to a social or an environmental initiative: KiwiHarvest or Million Metres. What’s more is with every purchase, five trees are planted in Indonesia in a bid to keep wildlife populations growing and also to provide subsistence to local communities. How bloody great is that? They’re also climate positive. What does this mean, you ask? Well, Duffle & Co calculated their entire carbon footprint (seriously, everything; from the journey of their fabric to typing on their laptops in New Zealand), in order to ensure an offsetting of their carbon emissions. Because of this they received their EKOS Certification and have offset their total carbon emissions by 120%! 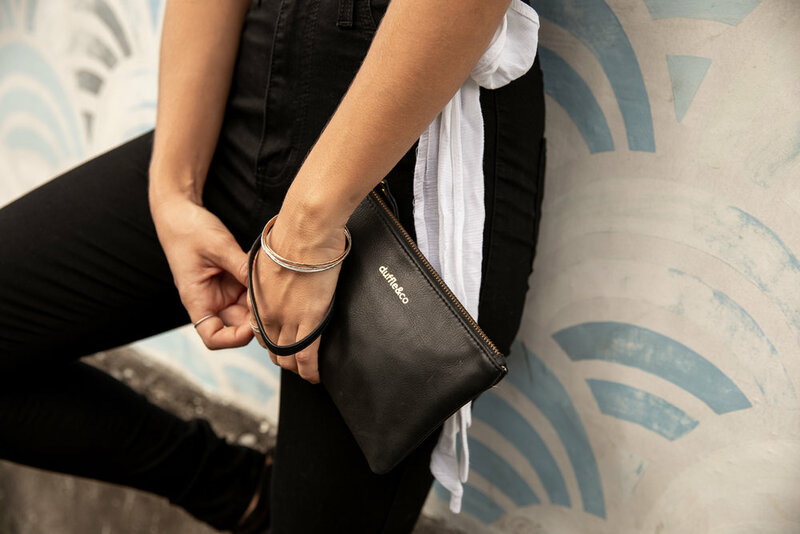 Also, as well as using standard leather, Duffle & Co creates some of their products with Pinatex: a leather alternative made from pineapple leaves. A vegan-friendly option for an everyday item? Yes please! “To create remarkable products, we know that every stitch counts. We don’t use mass production assembly lines. Instead, our range is carefully handmade by talented craftsmen. Here at Ethical Made Easy, we are firm believers in living your truths and leading by example, and this is at the core of why Duffle & Co do what they do. Their commitment to the six values they pride themselves on is reflected in every aspect of their work, from the sourcing of materials right through to the end product. If you need a bag or a wallet, go and check out Duffle & Co’s beautiful range of genuine leather products and vegan alternatives. Shop Duffle & Co HERE. An interview with the founders of Duffle and Co, Kai & Danny. What made you start Duffle&Co? Kai: For me it was a desire to do more both in a personal capacity but also a professional one. At the time of inception I was working in corporate finance and got the opportunity to help support a craftsmen in India. Danny, during his travels in India rang me up and asked if I was interested or knew of anyone interested in a satchel for work. After a lot of interest from friends and family we decided to pool our savings (not a lot) but we managed to buy 100 bags. Although it seemed like a big commitment at the time from us, it was nowhere near the positive impact it made for the craftsmen. We were blown away by the gratitude we received for supporting them, so started asking questions as to how someone so talented was left struggling to put food on the table. It was this experience was made us found Duffle&Co. Danny: I’ve always wanted to have my own business, and therefore was delaying working in the corporate world for as long as possible. I happened to come across a unique opportunity. Whilst in India, I met incredibly talented craftsmen and families, who were competing against sweatshops and fast-fashion factories. I saw what was going on first hand in the apparel industry and knew it wasn't fair. This motivated me to lend a helping hand to talented artisans in need by connecting them with the western world. Kai: Why have one when you can have many! Or at least, I've tried many over the years. Some worked well for long periods and others not so much. I think everyone is different and over time you also change so what works for one might not for another. I would however say having some routine or aspects of a routine is key. Things that I have tried and often chop and change include: reading /audio, affirmations, forms of meditating, gratitude exercises, exercising and a solid energy fuelled breakfast. At the moment I find doing 2-3 of these work well. It’s important not be to hard on oneself when missing a day or two! Danny: When I'm in a good working rhythm I do - i'll do some form of meditation, write in my gratitude journal and set my 3 biggest priorities for the day. What’s the biggest barrier you’ve found to succeeding as a socially conscious business? Kai: I think the most recent barrier has seemed the largest. The interesting thing when looking back to when we first started, the barriers faced seemed as daunting and as challenging as the ones we face now. However over time you get smarter and more resilient and although the barriers to growth get bigger and bigger, the biggest barrier is alway the one in front of you. There are a number of barriers but as a collective I would say trying to manage all parties best interests has been tough. Older more traditional business models operate with the business needs at the forefront. More innovative new age business follow a customer centric model with the customer needs at the heart of everything they do. As a social enterprise, we look at the social and environmental needs but as the same time knowing the importance of our customers and maintaining business needs to ensure our overall model is sustainable in the long run. Danny: I’m not quite sure where to start... I think it is easy for any business to donate their profit towards a cause, but it's difficult to go the extra mile and have both social and environmental benefit throughout the entire supply chain. For us, genuinely empowering our craftsmen, which means paying them fair wages & helping them to a build a better future while benefiting the environment, has been a huge challenge. Language, complications and cultural barriers aside, this comes at a cost and therefore makes it difficult for us to compete and maintain a viable business. But this is what makes Duffle&Co special. Within the ethical fashion community, there's a big question that we ask which is 'who made my clothes?'. In the scope of Duffle&Co, who made your accessories? Can you tell us a bit about them? We work with a number of craftsmen (men and women) from both Bali and South Africa. We know each craftsmen very well and personally spend a number of weeks with them each year hanging out in the workshop and going on team trips with them. Last year we went on a pretty epic tour around Bali. It was awesome to see the guys and girls enjoying the beauty of their home, with a lot of them having never ventured out of the local town or realising what their home had to offer! One thing I would say that people might not realise is that a lot of our craftsmen are similar in age to us - hungry millennials, and at the end of the day want exactly the same as we all do - opportunity and positive change. Danny: We work with a small community of 10 core craftsmen and tailors, most of whom grew up in Java (the most populated island in Indonesia) and moved to Bali seeking work opportunities. Sundari is our workshop mum. She runs around after her children, cooks meals for the team each day and runs the day to day operations. Then there is Gito, the extremely talented master craftsmen, he works with our designer to create patterns. Gito is a family man and his goal is to lay the foundations for his children to get forward in life. Sundari & Gito and most of the other craftsmen previously worked for Quicksilver & Volcom, until both factories in Bali shut down due to cheaper production abroad. It’s been cool supporting by bringing them back into employment. Why did you pick the fabrics or materials that you have chosen to work with? Kai: A numbers of factors. We are always on the look for natural, organic materials that can last a very long time to ensure we are not contributing to fast fashion and the environmental crisis. We also take into account the craftsmen's trade and what materials they are comfortable working with, and, of course customer feedback. It’s a combination of factors that take into account all parties needs including the people producing the products and the environment. We also realise that not every solution is a perfect fit for every stakeholder so we look to offset any short term shortfalls with long term solutions. We do this by contributing to initiatives like planting trees, investing in our craftsmen's children education and providing meals for those in need. Danny: Sustainable materials aren’t worthwhile if they don't perform or have the potential to look good. We have a formula for the design process for each product we create, which encompasses our materials. It also takes into account our core values, business needs, durability, style and is heavily weighted towards social and environmental impacts. So in short we have chosen materials based on their impact, viability & style. Kai: Tough to answer as there has been a lot that has resonated with me, but the first that comes to mind was something told to me early on in my career by a mentor. "The squeaky wheel gets the oil and the broken wheel gets chucked out” ... or something along those lines. My interpretation is that it's important to stand up for your values, your worth and your beliefs but there is a point where if you push to hard things start to backfire. It's a balancing act, everything in moderation and consistency gets you a long way. What’s next for you and Duffle&Co? Kai: We have experienced a lot of growth over the last 12 months and for now it's carrying on, doing what we do, but a little bigger and a lot better, to further strengthen our 360 degree benefit model. Danny: Going forward, with every product created, we plan to genuinely make the world a better place both socially and environmentally. Our focus is not to avoid harm or to slow down the negative impacts of producing, it's too late for that. By reversing environmental impacts and actually empowering people, we aim to bring benefit to the planet holistically. A few actions we are taking to achieve this are; focusing on using the best natural and recycled materials, facilitating environmental restoration projects, removing co2 from the atmosphere, working with large businesses to leverage positive change, building a workshop in Africa, educating communities and re-designing our products to be functional and last a lifetime to mitigate waste. Kai: Think and Grow Rich - There’s some core principles that every other book these day touches on. It's just a good book that has provided me with a solid base and foundation for everyday principals to drive forward success. Danny: Psycho Cybernetics. It proves that our self-image is the cornerstone of our mental state, and therefore of all the successes and failures that happen in our lives as a result. I think it is one of the best books in the self-help category and is a psychology masterpiece. The book has paved the way for most of today’s personal empowerment programs. I believe that if everyone had a better if we can all harness the power of our mind, we could make a greater positive change quicker. One documentary everyone should watch? Why?Kai: Searching for Sugarman. Just one helluva story! Danny: The Vice Documentary called The Third Industrial Revolution: A Radical New Sharing Economy. It’s not news that we are in an environmental crisis or we could even call it an existential crisis. This documentary brings forward how we could utilise technology to create a sharing economic in order to rapidly solve the major social and environmental issues likely to arise. Are there any other Movers & Shakers our there in your world that you think people should know about? Kai: Jayden Klinac - A mate from university who you kind of always knew was destined for great things. Recently he founded and launched 'For the Better Good' - a plastic bottle alternative that actually decomposes, and 'Buddy' - a hemp t shirt brand that looks epic and does good things for our environment! Danny: I am going to go with Yvon Chouinard (the founder of Patagonia).